Clean gutters in good condition drain rainwater through their channels and out the downspout directed away from your home. WE CLEAN GUTTERS LLC offers tips on how to check if your gutters are draining properly and if its time to schedule gutter cleaning for your home. Gutters are essential in our homes because they help to direct the rainwater from the roof to a designated place such as a water tank. Majority of homeowners usually install gutters then forget about them. We assume that they do what they are supposed to and we move on with our lives. Other times, it may be hard to know when there is a problem because we may not notice it during the sunny weather and we are in the house when it is raining. You may see the effects of a faulty gutter afterward. It is vital to monitor our gutters to know if they are working properly. Do Your Gutters Have Cracks or Faults? Gutters are exposed to additional pressure especially in areas that experience a lot of rain. The extra weight can make your gutter to start leaking. When this happens, call the professionals to come to help you out. A leaking gutter will not drain water properly and may lead to other problems such as damaging your roof. You might want to consider copper gutters as they’re less prone to cracks. Sometimes, leaves, sticks and other substances can accumulate in your gutter especially during fall when trees are shedding off their leaves. When you see the debris, it is a sign that your gutter is not draining properly. The debris usually changes how water flows from the gutter. Therefore, the water may not get into the tank and may accumulate in a section of your roof or house. The water can also stay in the gutter, and the extra weight of the water and the debris may make the gutter to collapse. It is essential to clean your gutter every season to avoid the accumulation of debris. Is There Water Near the Foundation of Your Home? One of the signs that your gutters are not draining properly is the presence of water collecting around your home’s foundation. You will especially notice this during rainy seasons or when it snows. Your gutter drains should protect your home from water damage by leading the water away from it. If they are not functioning well, then the water will go near your foundation. You may consider using a splash block on your gutter drain to ensure that water from the roof is drained a little bit far from the house. A downspout extension on the bottom part of your gutter drain can also do a good job. Is There Water in Your Basement? A faulty gutter cannot direct water to the correct place. The gutter may be filled with water and also debris and may spill over. Some of the water may find itself in your basement. This happens because the water collects at the foundation of the home and that is how some of it gets to your basement. Your basement may have water stain or a flood. Even stains on your basement wall could be a sign that your gutter drainage may be faulty. It is advisable to have this checked before the situation worsens and you get a poll of water in your basement. Are There Cracks in Your Home’s Foundation? It is normal for the foundation of a home to have cracks over time. However, you should know that water damage also results in cracks in the foundation. Water damage can come about if your gutters are not draining correctly. Do you now see the connection between faulty gutters and foundational cracks? This is not meant to cause you to worry because not every foundational crack is a cause for alarm or is caused by gutters not draining correctly. You should pay more attention to the cracks if they are bigger than 1/8 inch. If you notice your cracks getting wider, then you should check your gutter and check if there is water around the foundation of your home. Let us begin by clearing the air. Having molds in your home does not automatically mean that your gutters are not working correctly. However, damaged gutters can lead to molds in your home. When the gutters are not working properly, it means that they cannot adequately channel all the water from the roof to the designated place that is a reasonable distance from the house. What happens next is that the water is directed to areas near and around the house. Your home will then have higher humidity levels. Molds thrive in places with high moisture. Therefore, the water and high humidity will encourage molds to grow. You may even notice some white substance on your concrete wall. Is Surface Soil Near Your Home Soaked? 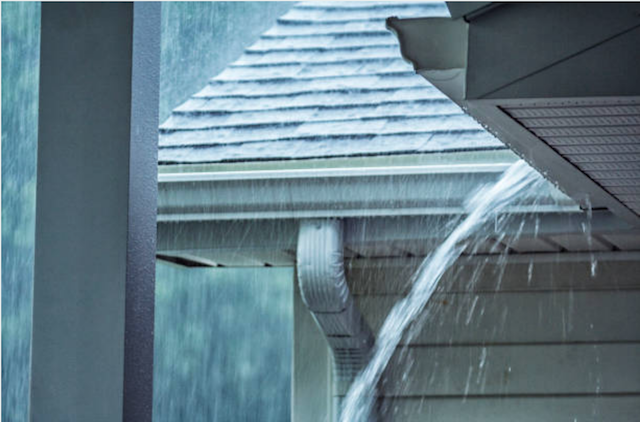 You may not see water dripping from your gutter (maybe because you are in the house when it is raining) to know that there is something wrong with your gutter drainage. When your gutters are not in good condition, water will be leaking from them and falling on the ground. If you are not experiencing any rain, but your soil is filled with water, then it may be time to look at your gutter. You may not previously be able to connect a soaked ground to leaky gutters. You need to be on the lookout for it. If you see some of these signs but do not know for sure if your gutters are draining properly. Do not worry because this happens. You can call a professional gutter installation and repair company to tell you exactly what is going on with your gutters. You will know the condition of your gutter with these tips. If it is faulty, then the experts will fix that for you so your gutter can continue to perform correctly. If you want your gutters to be in good condition, then you have to carry out maintenance. Clean it once a year or better still, once every season. The cleaning should be done especially after the fall season. Then you can remove all the fallen leaves and sticks that accumulate as debris on the gutters and block them. Having your gutters checked by a professional once in a while also does not harm. Is your home in our service area? Find out! Home » Gutter Cleaning » Are Your Gutters Draining Properly?